After Nov. 14, is transit finally moving forward in Burlington? BFAST volunteers answer questions at our display table at the Nov. 14 Inspire Burlington event featuring consultants Brent Toderian and Jarrett Walker. Will Nov. 14 go down in Burlington’s history as the day transit took a great leap forward? On that day, urban planner Brent Toderian and transit expert Jarrett Walker joined forces to advocate for the transit system Burlington needs to achieve its new urban vision of density rather than sprawl. In an afternoon-long session of City Council, meeting as a Committee of the Whole, the two urban experts presented ideas and advised Council on directions to finally bring Burlington’s transit system into the 21st century. That evening, they spoke before 450 people attending a session on New Directions in Transportation at the Burlington Performing Arts Centre. The presentation was part of Mayor Rick Goldring’s Inspire Burlington series of lectures on the future of the city. 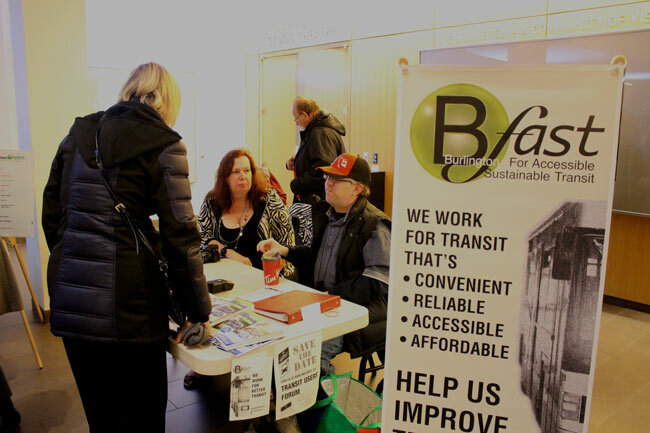 That more than 400 people showed up at the Performing Arts Centre demonstrated the community’s demand for better transit. During the Committee of the Whole meeting, Mayor Goldring declared that it was “time for solutions” that would mean additional funding for Burlington Transit. As a result of the work of Toderian and Walker, transit will play a bigger role in transportation planning in Burlington. Planning will begin on a new transit map for Burlington. The “chicken-and-egg” debate on whether density or transit improvements should come first has, it seems, finally been laid to rest, with the answer being we need both at the same time. Councilor Rick Craven, who vacillates on the issue, came out strongly in favour of better transit and went so far as to point out BFAST’s contributions to the transit debate. Councilors Dennison and Taylor, having seen an opening to continue to starve transit of funding, spoke in favour of a transit model that would deprive large parts of the city of any service whatsoever. Mayor Goldring said additional money for transit in this year’s (2017-2018) budget would be restricted to a staff study of what could be done in 2018-2019, meaning another year of poor service and declining ridership. Brent Toderian, the urban planner who was brought in to help draft Burlington’s strategic plan for transportation, said he saw a “substantial difference” in attitudes towards transit since he began working with the city 10 months ago. “Ten months ago, transit was not even part of the conversation,” he said. He warned that Burlington has to be ready for increased GO service with transit service that will integrate with GO schedules. He pointed out that in Burlington, the perception is that “anything to do with promoting walking, biking and transit is anti-car.” He warned that this attitude sends an “unhelpful and dangerous message.” More traffic means that Burlington is failing drivers too, he said. Transit consultant Jarrett Walker, who has helped many cities redesign their transit systems, may have unintentionally opened a door for Council’s transit opponents when he talked about the competing objectives of frequency and coverage. Walker used the example of a community that has two main roads and a number of suburban subdivisions of winding crescents and small cul-de-sacs. If you had a fixed number of buses, he asked, how would you allocate them? If your objective was frequency and higher ridership, you would allocate all of your buses to the main roads, providing regular and timely service that would attract riders. But if you saw transit as a social good, providing service for everyone in all parts of the city, you would have to decrease service on the main roads in order to provide it on the winding streets of the subdivisions. According to his own very rough estimate, he said, Burlington’s transit system was geared to frequent service with a weighting of about 55%, with 45% aimed at coverage. But he said Burlington had an ideal grid system for a frequent-service model, with two-kilometre squares surrounded by main streets. He used a series of maps of transit in other cities to demonstrate that the frequent- service model provides more opportunities for more people to get to more places. But his projections also showed that the frequent-service model left large swaths in the maps with no transit service whatsoever. Critics of this model in Houston, where Walker helped remodel the transit system, have said it drastically cut service to large sections of the city and left many who depended on transit in the lurch. But Dennison jumped on the frequent-service concept, asking whether the system could get to a 75%-frequency model “if we take out everything” except service on the main arterial roads. Taylor said Burlington was already “looking at a four-percent tax increase every year for 20 years” to address the need to repair crumbling infrastructure. He said the city should “get away from coverage” as a goal and concentrate on increasing ridership on main streets. Left unsaid explicitly, but strongly implied in the two councilors’ remarks, was that transit could continue to be underfunded if resources were taken away from coverage and applied to frequency. Also left unsaid was that a transit model that relies completely on the grid system would leave a lot of people with a walk of a kilometer or more to get to a bus stop. We can expect that the city will put some resources into staff planning for the new system over the next year. Hopefully, some of those resources will be directed towards public consultation. In the end, the transit debate will come down to how much support there is on Council for an adequately funded system. Perhaps Goldring is counting on some changes in Council in 2018 to put transit on a firmer footing. Transit supporters, in the meantime, will have to work hard to make the issue a prominent one in the campaign. This entry was posted in BFAST News on November 21, 2016 by Collin Gribbons. Just saw the new budget. Transit went from $10.1 million for 2016 to $10.5 million for 2017. Something tells me we won’t be seeing this “every 10 minutes” frequency they have the audacity to advertise on the city buses.